I’m using a custom grid layer consisting of two boxes (8x8 and 16x16), which I show/hide via a shortcut (Alt-G). 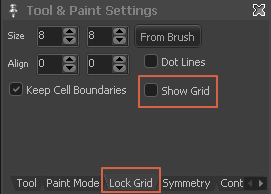 The issue I’m having is that when I activate the grid lock (shortcut G) a default 8x8 grid layer is always made visible. Worse yet, I can’t toggle it off while the grid lock is enabled. Is this the expected behaviour? I think ProMotion 6.5 got it right: enabling the grid lock should not force the display of any grid layer. These should be two independent actions altogether. Jeez, that was pretty obvious - my bad!